A debate has existed about the Rated Range value in the Tesla Model S. The number appears to vary quite a bit from car to car. Some Tesla employees have told customers that the number does depend upon driving habits. Other Tesla drivers have claimed that these employees are misinformed and the number exclusively depends upon the state of charge of the battery, and perhaps would be worried if their number was lower than another driver’s Rated Range. Q1: What is your rated range after a full non-range mode charge? Q2: What is your Average Energy for your car? This info is under Controls / Trip. Please provide the data for the longest distance trip available. Q3: What is the Distance given in the “distance column” in the same line? Q4: What version of OS is your Model S on? 4.4 ? 4.5 ? Don’t know? Q5: Is your Model S battery 60kwH or 85kwH? To attempt to answer this question, I surveyed Tesla drivers and received sixty three respondents, two were 40 kWh battery owners. Fifteen of the respondents own the 60kWh battery version. The data from this smaller set is a bit more straightforward than the data from the 85kWh battery. One small problem with the survey is I am assuming there is a strong correlation between the “distance column” and the car mileage. Ideally, I would have asked another question about the vehicle mileage. Since the cars have been in full production for less than a year, I am not expecting dramatic battery degradation or very many high mileage vehicles. I also assumed most owners would keep either Trip A or trip B as the full vehicle mileage in order to get a gauge of their true kWh energy usage. I have maintained trip A for this purpose because in the Roadster there was no other method to measure how much energy I used over the lifetime of the vehicle. Regardless, I think there is a correlation between the distance reported and the car’s mileage in most cases. A few respondents also answered they either did not know their OS version or were using version 4.4. Eliminating these data points did not significantly change the graphs below. First, lets look at the data for Rated Range vs. 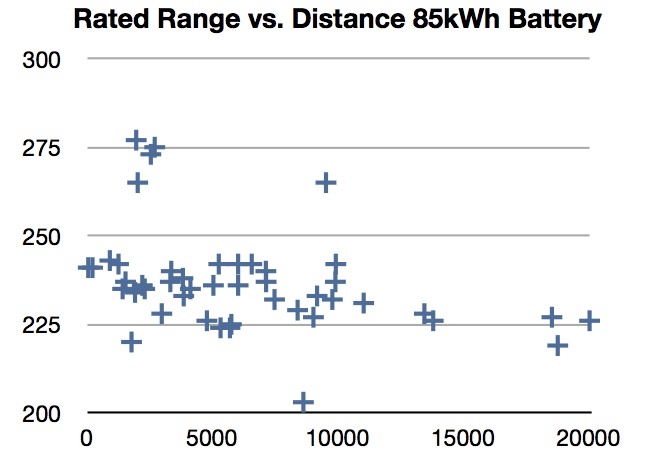 Distance in a 60kWh battery. For this battery, there seems to be perhaps a small amount of battery degradation for the high mileage driver with around 15,000 miles is getting a rated range of 178. Interestingly this individual is also driving the most conservatively (or energy friendly) of the the 60kWh battery group using only 291 Wh / mile. A total of seven respondents managed to achieve under 300 Wh/mile. The rest of the statistics seem to indicate no appreciable difference in mileage for the 60 kWh batttery before 10,000 miles and no correlation appears to exist between rated range and mileage. 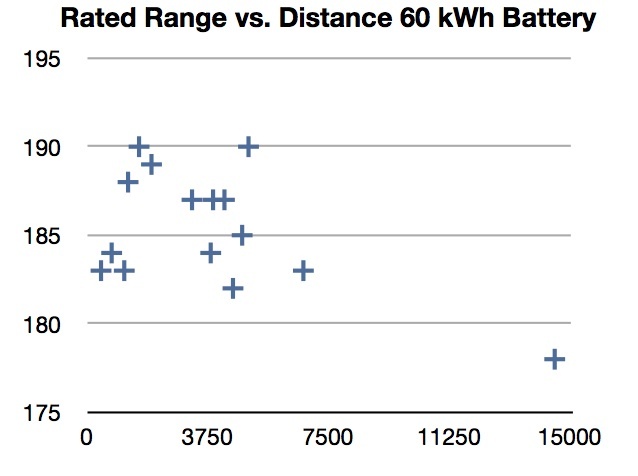 Also for the 60 kWh battery there seems to be no correlation between range and energy. Looking at this small set of data for the 60 kWh battery there seems to be little correlation between rated range and driving habits, which would be reflected in energy usage, and too little data to indicate any problems with battery capacity. 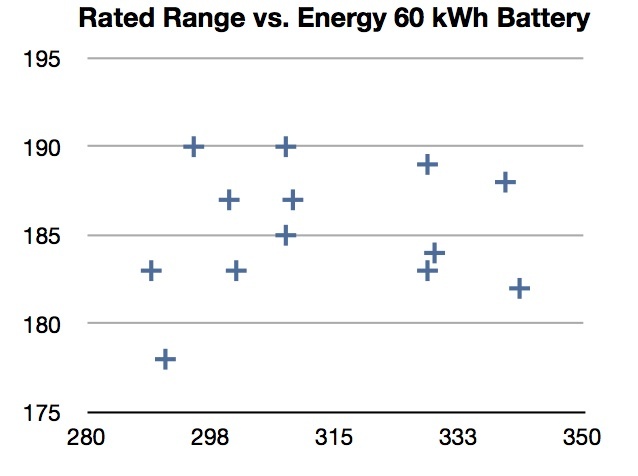 The “range” of rated range for a 60kWh battery is between 175 and 195 for unknown reasons. The two data points for the 40kWh battery was 140 and 143 rated range. The data set for the 85 kWh battery is larger with 47 responses. In this data set the results are for the most part consistent with the rated range within a band of 220-245. The outliers are a bit perplexing. All but one reported a very high rated range near 275 are on 4.5 or above operating systems and have vehicles with at least a couple thousand miles on them. Their energy / mile usage varies. One vehicle reports a rated range of 203. This 203 rated range vehicle does not have a particularly high energy consumption per mile. The data could be an errant typo in the survey, a non-full range charge or a problem with the vehicle. This final chart shows the same lack of relationship rated range and energy. The few outliers in the chart are the same outliers in the earlier chart. I think this question is still perplexing as the range values vary a lot from car to car for mysterious reasons. 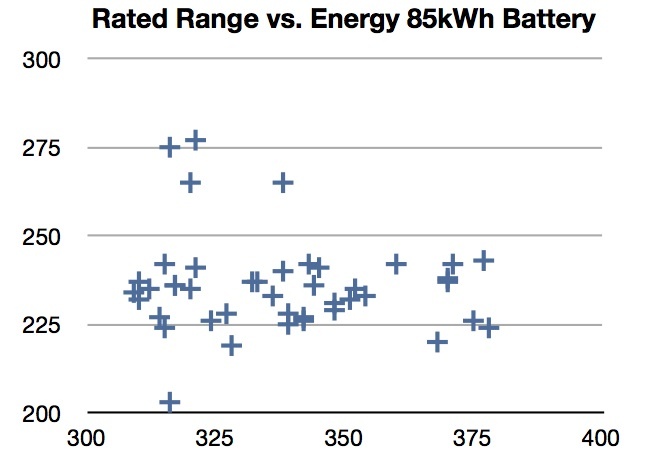 Why would a 85 kWh battery have a rated range between 220 and 245? I think this survey almost asks more questions than it answered. There is clearly not a clear correlation between long term driving habits and rated range. Perhaps immediate short term driving habits? Or perhaps the car simply cannot measure the amount of energy in the battery very accurately. Also how accurate, reliable and useful is this rated range number? Why is there so much variation in the rated range number in the Model S? I did experiment with merging the data to see if there was a weighed factor equation between the two. After some experimentation, I could not significantly improve the chart to demonstrate any useful information. What I would personally like to see is an accurate consistent rated range that I could understand and also a simple energy measurement. I would like a gauge that simply said 55kWh left in my battery. I would find this more straightforward. I can do the simple math in my head to convert that to “can I drive to X without recharging”. I am also wondering if part of the problem with giving these accurate numbers is that historically cars do not give you accurate measurements of remaining fuel. All of the cars I have owned have had crude analog gauges or digital readouts that were stepped scales not a simple numeric readout “12.1” gallons left. I am looking forward to any comments on this survey. This entry was posted in charging, Efficiency, Energy, Model S, Range, Software, survey. Bookmark the permalink.